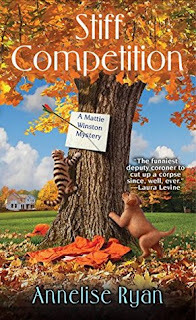 Annelise Ryan's Mattie Winston Mysteries are such fun reads that I look forward to each and every one. Stiff Competition is no disappointment; in fact, it may be the best of the series so far. The book picks up eight weeks after it's predecessor, Stiff Penalty, left off. It's Mattie's first day back at work as Deputy Coroner after the birth of her son, Matthew. She and her son's father, Detective Hurley, are still living apart and unmarried for a lot of reasons. Hurley's teenage daughter, Emily, who recently moved in with him after the death of her mother, still hates Mattie. Emily also seems very jealous of Matthew and Mattie is not entirely sure that Hurley is ready to take on another responsibility. Her first day back starts with a dead body in the woods on the first day of hunting season, a very important day in Wisconsin. The body is that of a newly arrived land developer who has made a lot of enemies in town. The price of his dealings is an arrow through the neck and a long list of suspects. Meanwhile, Emily has gone missing. It isn't the first time but she has always been available through her cell phone. The cell phone only goes to voice mail and Hurley is getting very worried. So worried in fact that Hurley hands off the murder case to his associate, Bob Richmond, and Mattie to work. Both of the plot lines are intriguing but I have to admit I was much more interested in Emily's disappearance. Annelise Ryan manages to inject her trademark humor and her real life medical expertise into what could be a very dark book. I really enjoy all the colorful characters that have played a part in the books and in Mattie's chaotic and frequently hilarious life. 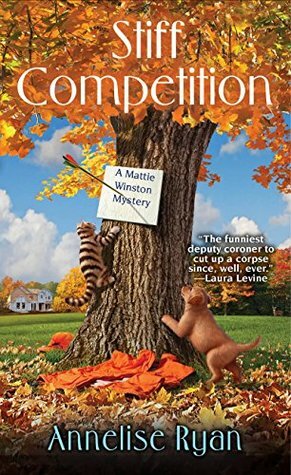 I highly recommend the Mattie Winston Mysteries to "cozy" fans. Thanks to Kensington and NetGalley.com for an advance digital copy.